CN Rail says it saw a significant ramp up in crude-by-rail transport volumes in the middle of last year, thanks to persistent bottlenecks in Canada’s export pipelines. Crude oil shipments rose to 232,000 bbl/day in the fourth quarter, up from 129,000 bbl/day in Q3. Volumes averaged 133,000 bbl/day for the full year 2018, still well below the 2014 high of 209,000 bbl/day. The company says demand remains strong, but it expects to be negatively impacted in the first quarter by the province's mandated production cuts. Negotiations continue with the Alberta government to start shipping more crude-by-rail by the end of this year or early 2020. The province had previously announced plans to buy, rent or lease enough railcars to ship 120,000 bbl/day, but did not specify which crude would be shipped to what customer. 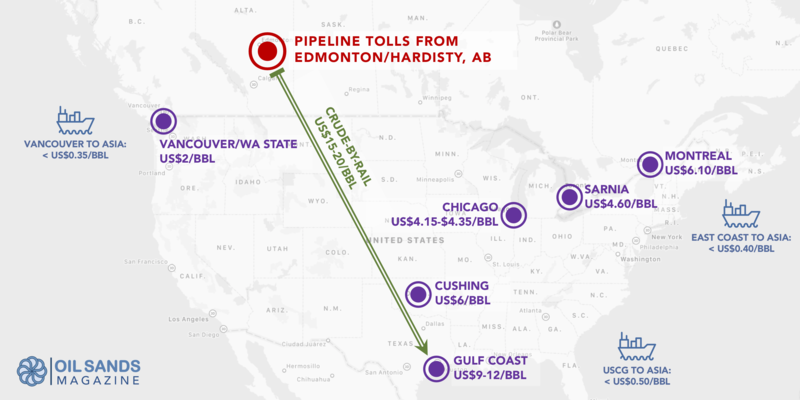 Since production curtailment was announced late last year, the heavy oil discount has narrowed to less than US$10/bbl, which is below the cost of shipping crude by rail to the US Gulf Coast (USGC), the preferred destination for Canada’s heavy crude. Most analysts estimate a spread of at least US$15 a barrel is required to make crude-by-rail economical. Late last year, CN announced a three-year deal with Cenovus to ship their heavy crude to the USGC. Both CN and CP have promised shareholders they would be asking shippers to sign longer term agreements with guaranteed minimum volumes, similar to contracts used for pipeline transport. According to Statistics Canada, over 500,000 bbl/day of petroleum products were loaded onto rail cars last October. About 330,000 bbl/day was in the form of crude oil, destined for export to the US. CN says total revenues from the transport of petroleum and chemicals rose 50% y/y to $815 million in the fourth quarter. Total overall revenues for the company rose 16% y/y to $3.6 billion in Q4.